A feel good movie that requires you to buy into it, as its main character breaks all the rules, isn’t the least bit sneaky about it, and manages to get away with everything. A very average movie that has an interesting enough premise, but just goes for the ridiculous cliche way more often than it should. this movie is about a guy who takes on the institution. he is a student at medical school who is out to prove that the way doctors are doing it is wrong. patch believes in using humor to break through to his patients, and personalizing the relationship with them. he doesn’t believe that doctors should get the high and mighty respect that they are given, and instead, thinks they should let loose a little. but to imagine that all doctors don’t have a sense of humor is ridiculous. patch spends the movie sneaking around the hospital and trying to prove his theory, and sometimes it’s funny, but most of the time it’s just absurd. there are some unexpected moments here, like what happens to his girlfriend, but more often than not, the movie is either being unrealistic or cliched. 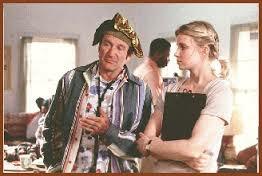 Patch Adams is an okay movie. it’s certainly not realistic at all, with a main character who never has to face the consequences that he should. 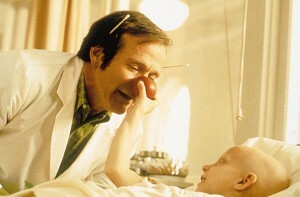 patch (played by robin williams in a role that only he could have done), is a guy who thinks all authoritarian figures are wrong and evil, because they are the guys with power. he thinks that doctors should get down on the floor with their patients and be called by their first names. he acts as if doctors are mean to their patients, because they don’t act like clowns and jump around doing routines to make the patients laugh. the whole thing is a little crazy, but it’s also something kind of different. the stuff about authorative figures being the villains isn’t different at all. that part is totally cliched and routine. the new idea is this premise about an older guy in medical school who breaks all the rules and sneaks around, trying to see patients. before any of that, we meet patch in a mental institution that he has checked himself into. i would have liked to know more about this storyline, and why he’s so depressed. he interacts with patients who are so out there and mentally unbalanced, that it seems preposterous for him to be in the institution with them. he’s a little depreseed? so what. go see a shrink. but a mental institution? apparently he tried to kill himself, and the movie should have gone into that a little more. while in the institution, patch realizes that the doctors there don’t listen to their patients. he’s got one doctor in particular, who is totally focussed on his coffee, and doesn’t even look at his patient let alone listen to what the man is saying. so patch decides that all doctors are doing it wrong, and that he knows how to do it right. he jokes around with the patients about one of them who is catatonic, and can’t put his hand down, and we are somehow supposed to believe that this is helping them. luckily the movie gets better once patch arrives at medical school. now, i don’t know how it can justify that he gets some of the top grades in his school without studying, but the interactions he has with the other students are a lot of fun. there’s one guy, named sherman, who becomes his best friend. then there’s his roommate, mitch, played by phillip seymour hoffman. and then there’s carin, the girl who patch develops an instant crush on, played by the beautful monica potter. right away, from the very first lecture in school, by dean walcott, patch finds the man repulsive. the dean tells them in his speech that he is going to take all feeling and heart and emotion out of them and make something better in its place. he’s gonna make doctors out of them. it sounds like he wants them to be robots, who are great at doing a task, but show no emotion or caring at all. patch has a problem with this, and starts immitating the dean to sherman at a local diner. then path starts sneaking into the hospital to see patients. it’s a rule that no medical student is allowed to see patients until year 3, but patch doesn’t care. he starts out by going on rounds with a doctor and a group of students, and asking the one question that nobody else does…what’s the patient’s name? the idea is that they treat patients like a disease, never really knowing the person, but for a guy trying to stay inconspicuous, maybe asking a question like that isn’t the best idea. when he ducks into a room to avoid the dean, who is walking by (would the dean really know him, and know that he’s a first year student, anyway? ), patch finds himself in the children’s ward. these kids are all very sick, and most of them are bald. patch grabs a bed pan and a rubber ball which he turns into a nose, and starts doing a routine. all of the children sit up in their beds and he makes them laugh. but they also make a lot of noise, at which point patch would start getting caught and getting into trouble. now there are three times when patch is indeed caught. the first time, it’s just by the dean, who asks patch to come to his office. he tells patch to stay out of the hospital, and threatens the way his grades are suspicious. the second time, the dean dismisses him from the school, attempting to kick him out. patch goes to see the headmaster, and the dean’s boss, and convinces this headmaster to let him stay on. this is highly unlikely. and then at the end, patch is kicked out again and brings his case in front of a trail of school board directors. once again, not surprisingly, patch wins. the best things about the movie happen in the middle portion of the film. his relationship with karin is interesting, and so is the way that the phillip seymour hoffman character interacts with him. for most of the movie, the two of them are enemies, and they have one really nice, heated scene with each other. patch ends up starting a free clinic, and what happens to karin, while she is working for the clinic, is the most powerful and haunting thing about the movie. aside from that, there’s a great moment where a bunch of gynocologists visit the school and patch is put in charge of setting the place up for them (really? he’s the guy they put in charge? and nobody oversaw what he was doing?) Still, unbelievable as it may be, the turnout and punchline of how he decorates the place ends up being very funny. the movie really falls apart in it’s final act. this is the trail climax, of course, and patch addresses a whole bunch of students in the audience, telling them what the board wants them to be, and how they have to steer clear of it. this is all happening while the board is judging him and making a decision about him. so, instead of patch defending himself, he’s gonna start preaching about how the board members are the bad guys. the whole thing makes no sense. when the kids show up and put on their noses, it’s just going too far. so are the words that the head judge has for the dean about “excessive happiness.” patch adams is a decent movie, with lots of enjoyable moments, but you really have to suspend disbelief with the storyline. it is very cliched, and probably more of a movie for young adults than for realistic-minded older folks.